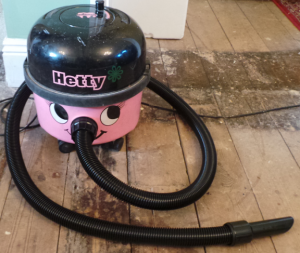 We have had the female version of the Henry vacuum cleaner for about 3 years. It is exceptionally well made and also very simple. There is nothing much to really go wrong with it. However, if it does you can buy British made parts quickly and easily. The thread went on the hose of our Hetty vacuum recently so we simply bought a replacement. It arrived the next day and now Hetty has had a much needed nose-job. I have a George, it really is the most superb cleaner. There is nothing he can’t do, great value for money and as you say all the bits and bobs that he comes with are beautifully made. Henry is a great cleaner and part of the family!! My first Henry provided an excellent service for 25 years. I’m sure Henry2 will match that!